You activate your overhead lights and the driver pulls over immediately, barely giving you time to stop at a safe distance. You get out of your car with your high powered flashlight in hand. Headlights from oncoming traffic are making it even harder to take in all the sights. In fact, your own flashlight beam is nearly useless against the dark of the window tint. The driver’s window is lowered; to your relief, an elderly woman with a poodle in her lap greets you with a large smile. This exchange went well. Turned out to be nothing more than a driver distracted by an active poodle. To a street cop on patrol in most medium sized cities in America, this scenario maybe replayed as many as 20 times every eight hours. The car stop is statistically the single most dangerous activity an officer can engage in and it can be even more dangerous when a car’s windows are tinted. While we all are able to accept that the reason for window tinting laws is officer safety, it is often surprising the degree to which these vehicle code laws vary from state to state. If you look at just the rules regarding the tinting of the front side windows in four states- California, Arizona, Maine and Florida-the differences are noteworthy. Florida law says that they must allow more than 28% of light in. The other restrictions regarding reflectivity, the need for outside mirrors and degree of light penetration are equally as varied. Added to these state-to-state variations is the fact that enforcement may differ as well. The importance placed on enforcement can really be an issue for the owner of a car. He may have a vehicle that is not in compliance with state law but enforcement in his local town may be very indifferent. The driver of the same car may enter a large city in the same state and be immediately stopped for improper window tinting. The important thing to remember is that it’s your responsibility to know the laws about car window tints in your state before you go to the retailer for application. This way, you know you will be getting the product and service that does you more good than harm. For all the reasons mentioned above I have an iron clad method to relieve the patrol officers stress in night situations. I calmly pull over, get completely off roadway, put the vehicle in park, roll down all windows and turn on interior dome lamp. As the officer stops behind me, he sees my reverse lamps light up as I put in park. As he approaches my car, he can hear the engine is NOT running. He can see clearly inside the vehicle, and the windows are open. I have never had anything but pleasant experiences on night stops. I have instructed all my entire family that this is to be there standard operating procedure for ALL such stops. This procedure should be taught in drivers ed. Along with an explanation as to why all these things should occur. Young drivers are still egocentric caring nothing about the officers situation, including the danger, real and perceived. Someone please explain the difference between a truck and SUV verses a car. 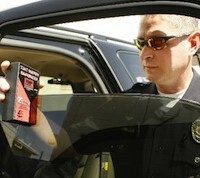 All back Windows in trucks and SUVs can have very dark tint and cars have to have legal tint all around. I have a Ford fusion with legal tint on front side Windows and dark on back window and 2 back passenger windows. I’ve had several passenger cars over the years and never had a problem. I went to Prattville, AL a few weeks ago in my Fusion and received a ticket. LUCKY ME. If it says 50% of light must show through than does that mean I can’t get a 35% vlt tint? I guess what I’m asking is does that mean 35% shows through or 65% shows through? Good read. I agree with the tint regulations they make sense, however knowing them before getting you car tinted is very helpful and can help you avoid a ticket or fine.